Minute taking can be a daunting task but it needs to be done to keep proper records of a board’s decisions and to serve as a road map of past, present and future plans. A board member or property manager is frequently tasked with taking the minutes, however, this can disrupt the flow of a meeting as it prevents the assigned minute taker from actively participating in the discussion. This can also cause the minutes to be subjective instead of objective and unbiased. It takes a specialized group of skills – and often proper training – to understand how to put together a clear, concise and objective set of minutes. A lot of light has been shed on the importance of taking and keeping minutes recently. 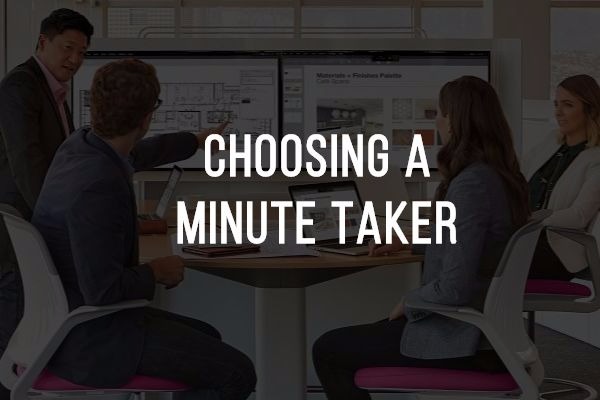 If a board lacks a designated, detached minute taker who isn’t required to actively participate in the meeting, a good solution is hiring a third-party minute-taking company. In that case, there are options. 1. Can you provide three recent referrals? 2. How do I know the individual you are sending into my meeting is qualified? 3. How quick is your turnaround time for a completed set of minutes? For all your questions about minute taking and everything involved, contacting Minutes Solutions may be your first step to a stress-free solution.